P.S. I am joining What's Cooking Wednesday at my Beyond You site. If you love veggies you may check the recipe out there later. I love blue, it looks like the same color I painted my toenails. You have such nice hands!! Love the color! i wish i have such lovely hands. ilove the color too. happy WW! 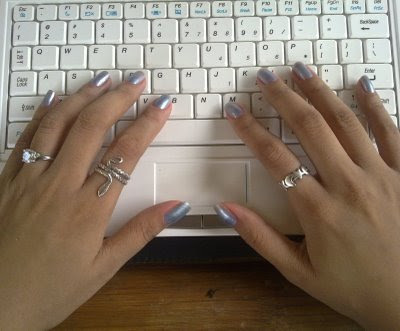 That's a beautiful photo, even without the context, just the hands and the jewelry and the keyboard. Ganda! How do you keep the polish? Mine gets damaged after a few hours. :) Happy WW! That is a nice shade of blue. Love it. They look very beautiful to me. Beautiful photo. Great color on your elegant hands! my girls like blue nail polish! You do have beautiful hands! I like the color not too harsh and not dull, just right.